The narrow-gauge Georgetown Loop Railroad is a short, but very popular and scenic tourist railroad located in Georgetown, Colorado and operated by the Colorado Historical Society as the Georgetown Loop Historic Mining & Railroad Park. The scenic line dates as far back as the Colorado & Clear Creek Railroad of 1865, a Union Pacific subsidiary, when it was chartered to serve thriving silver mines near Georgetown and Silver Plume. The mines only remained in operation through the first half of 20th century and before 1940 the railroad had mostly shutdown. Interestingly, the little railroad has refused to die, in no small part due to its spectacular scenery of the canyons west of Denver and impressive engineering that requires four miles of tunnels and large cuts and trestles to connect the two towns of Georgetown and Plume that lie only two miles apart! What is today known as the Georgetown Loop Railroad (reporting marks, GLRX) was initially constructed as a subsidiary of the Union Pacific and dated back to the Colorado & Clear Creek Railroad of February, 1865. Meant to serve the region's silver mining industry (much like the Denver & Rio Grande Western's lines to the south), this narrow-gauge line was renamed the Colorado Central Railway in January, 1868 and by August, 1877 it had opened its main line between Denver and Georgetown. However, after Union Pacific fell into bankruptcy in 1893 its mine branches were picked up by the Colorado & Southern Railway’s subsidiary, the Colorado Central Railroad. While the railroad continued to operate as a functioning freight railroad under the C&S, by the 1930s all of the mines and freight traffic between Georgetown and Silver Plume had dried up in 1938 most were abandoned and scrapped (during peak operations before the Sherman Act of 1893 the C&S operated narrow-gauge mine branches reaching Como, Leadville, and Gunnison). However, the railroad proved to be a scrappy survivor and in the late 1950s efforts were in place to restore the entire railroad and its engineering marvels. Despite the fact that the narrow gauge lines in the region had long since been torn up, in 1959 the Georgetown Loop Historic Mining & Railroad Park was created by the Colorado Historical Society with the hopes of eventually returning trains to part of the original right-of-way. After successfully receiving donations of land, old mining claims, and buildings along with used ties and tracks provide by Union Pacific the society began reconstruction of part of the line east of Georgetown in 1973. 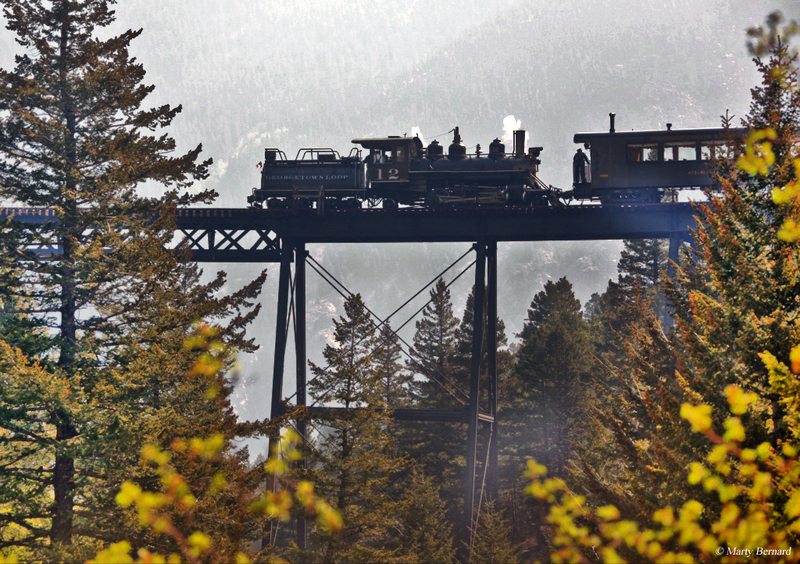 The Georgetown Loop Railroad opened to the public on March 10, 1984, after three miles of line had been rebuilt including the famed loop and High Bridge. For power the Georgetown Loop Railroad currently employs two diesels and one steam locomotive. · #12 – An ex-Kahului Railroad Baldwin Locomotive Works 2-6-2 Prairie steam locomotive. · #21 – An ex-Rocky Mountain Steel Mills General Electric 44-ton diesel switcher. · #1203 - A 75-ton Porter diesel locomotive, newly acquired in the spring of 2008. Today, the railroad operates in a very similar fashion to the famed Durango & Silverton and Cumbres & Toltec Scenic excursion trains located to the south on the Rio Grande's former mining branches. 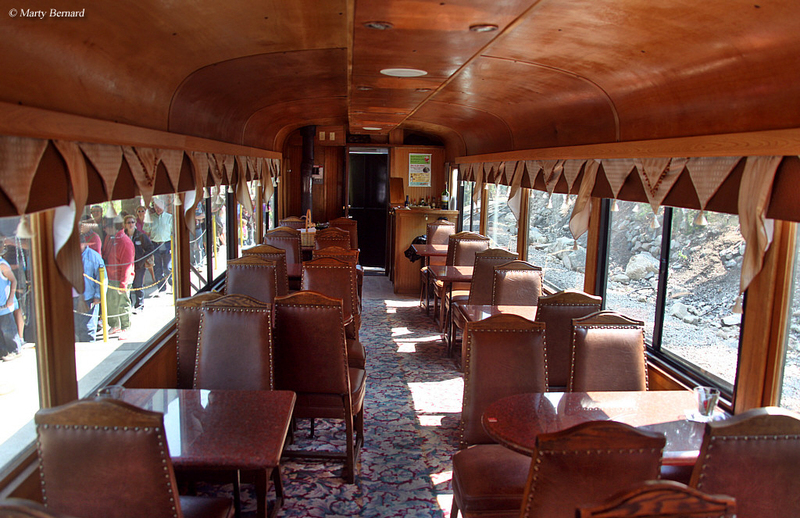 It truly is amazing how many historic and breathtaking tourist trains operate in the state of Colorado today as you have your choice of several to ride. While the Georgetown Loop does not offer as many miles to ride as either the D&SNG or the C&TS it includes everything else, outstanding views and historic steam locomotives. Today, they host a season that runs between late May through October as well as several dinner trains, holiday specials, and charters. Along with the Georgetown Loop Railroad’s motive power they also have several cars (from coaches to open gondolas) either in use or on display (several of which are either of Denver & Rio Grande Western or Colorado & Southern lineage). All in all, a trip aboard the railroad to see the beautiful scenery and magnificent engineering feats of this little 4-mile railroad is well worth the time and drive to Georgetown, Colorado. Thanks to Shane Schabow for help with the information this page. If you are perhaps interested in riding aboard the Georgetown Loop Railroad or would like to learn more about it please click here to visit their website. There you can learn more about everything they currently offer as well as information about pricing and what you do around the area. If you would like to learn a little more history about the Colorado & Southern please click here. 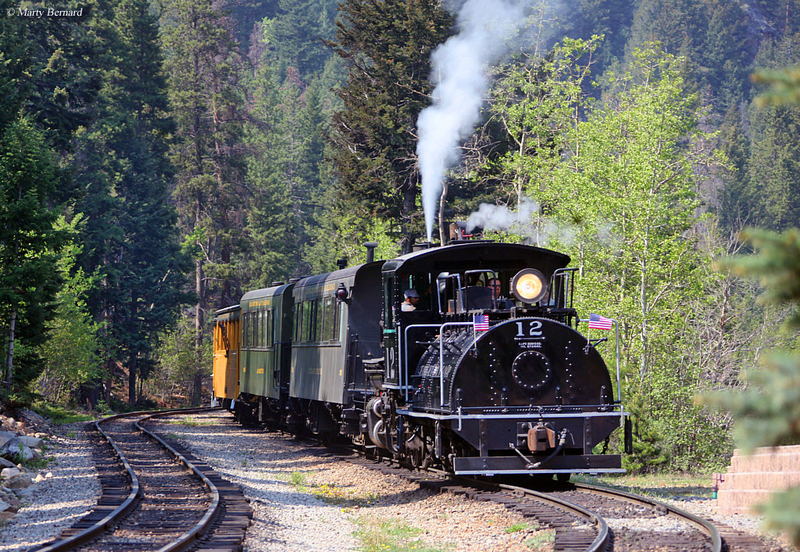 For more information about excursion trains like the Georgetown Loop Railroad you might want to consider the book Tourist Trains Guidebook, which is put together by the editors of Kalmbach Publishing's Trains magazine.